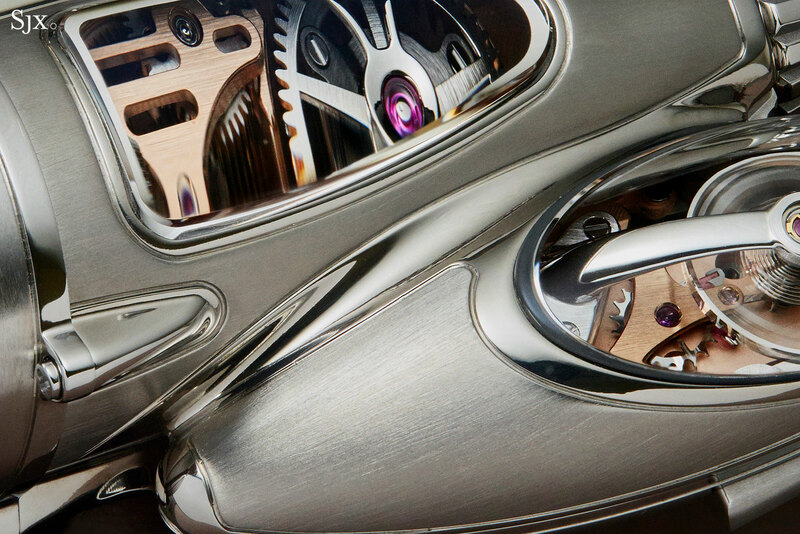 Twin balance wheels, a differential, and sci-fi watchmaking. 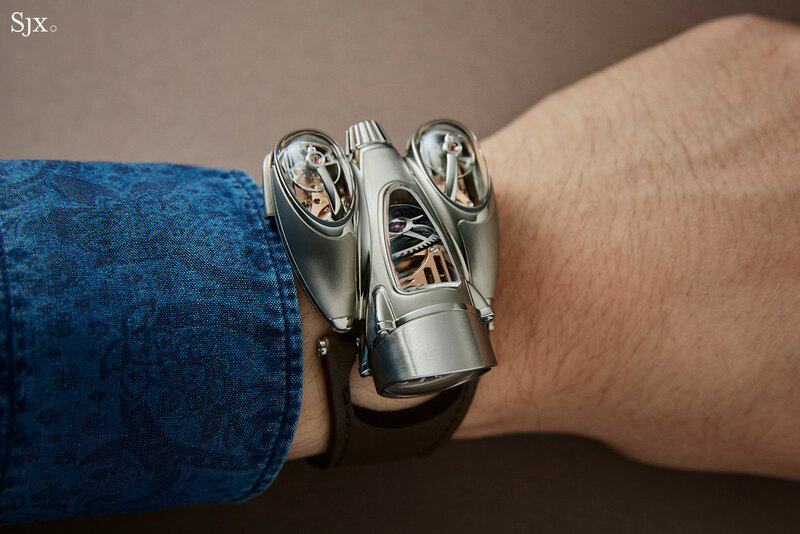 After a few more restrained recent outings, MB&F has returned to outer space with the Horological Machine No. 9 (HM9). 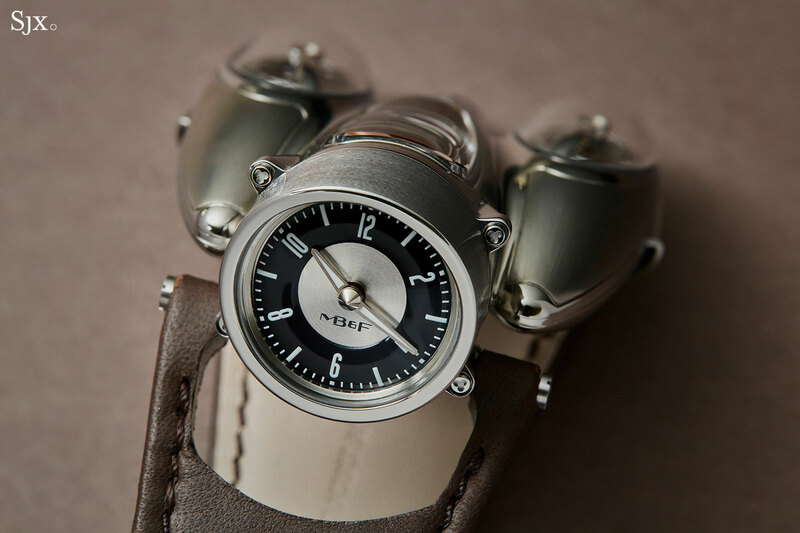 The coolest Horological Machine of late, the HM9 is reminiscent of the HM4 “Thunderbolt”, a resemblance perhaps driven in part by the HM4’s desirability on the secondary market. Like many “machines”, the HM9 is a sleek, sculptural timepiece powered by a movement made to the case, giving it a delta-shaped form. But the movement is also one of the most complicated to be found in a Horological Machine, not merely because of its form but the fact that it’s regulated by twin balance wheels linked by a differential. 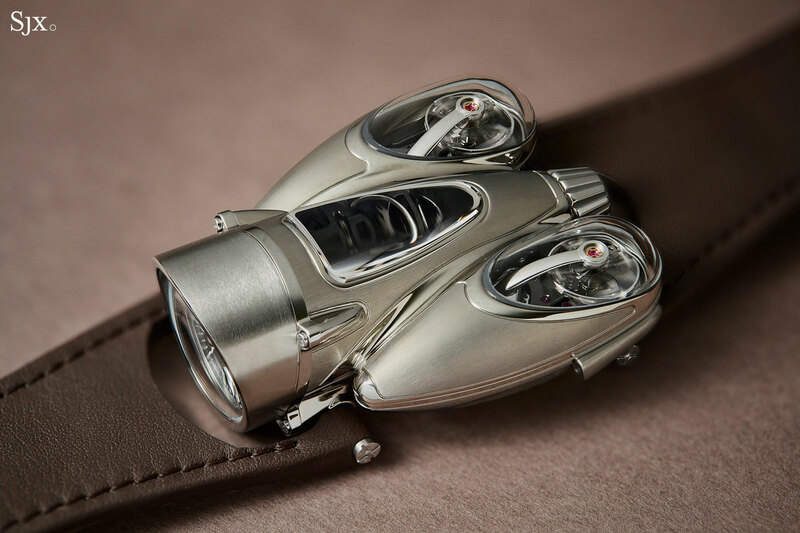 Like many of MB&F’s other Horological Machines, the HM9 is a driver’s watch, with the time shown on a vertical face, allowing the watch to be read with one’s hands on a steering wheel. 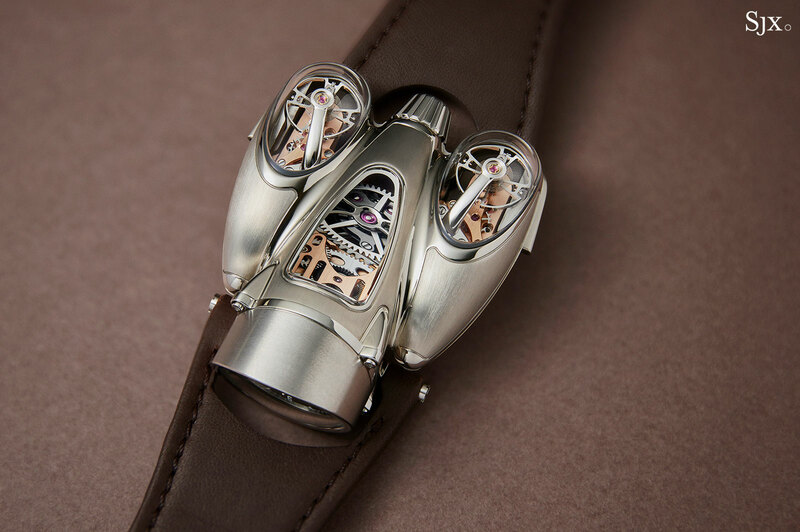 But more importantly it is an artful blend of the twin philosophies that shape each of MB&F’s model lines. While the form and style is vintage Horological Machine, the movement takes inspiration from the Legacy Machine 2 (LM2). 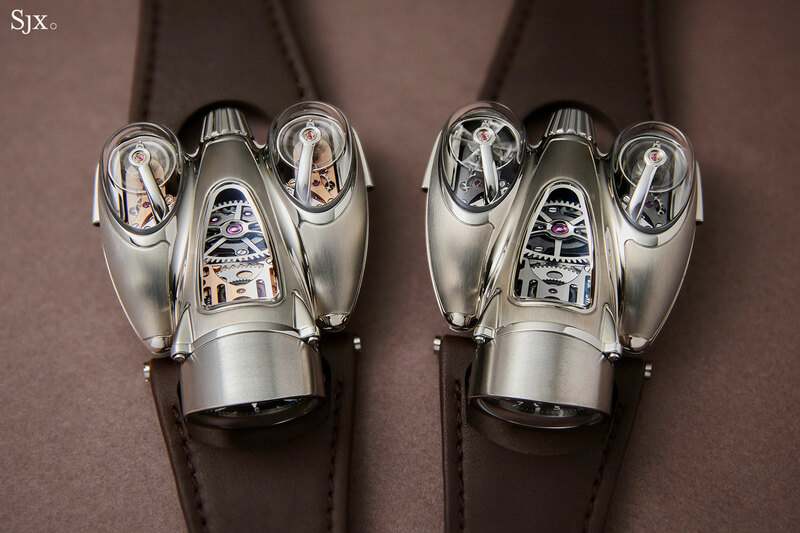 The LM2, introduced in 2013, was MB&F’s first foray into double regulators. 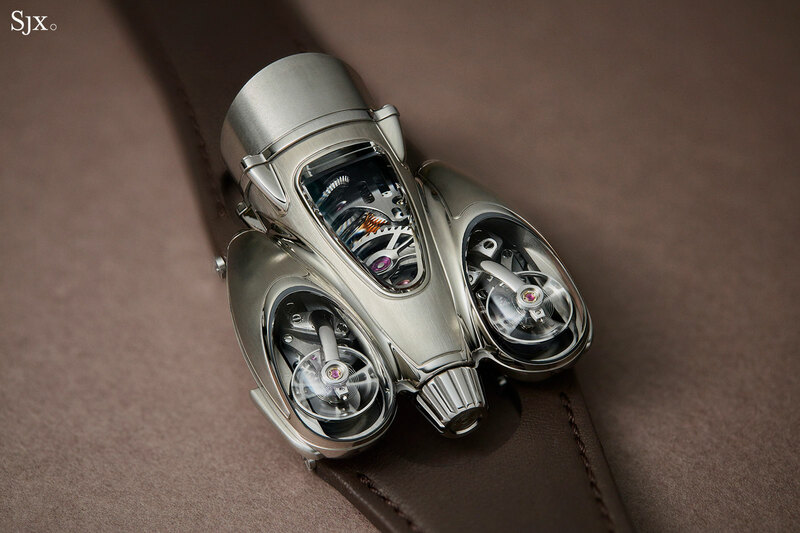 While the HM9 shares the same oversized balance wheels and barrel of the LM2, its movement is entirely new, developed from the ground up by MB&F’s in-house constructor, Guillaume Thévenin, over three years. 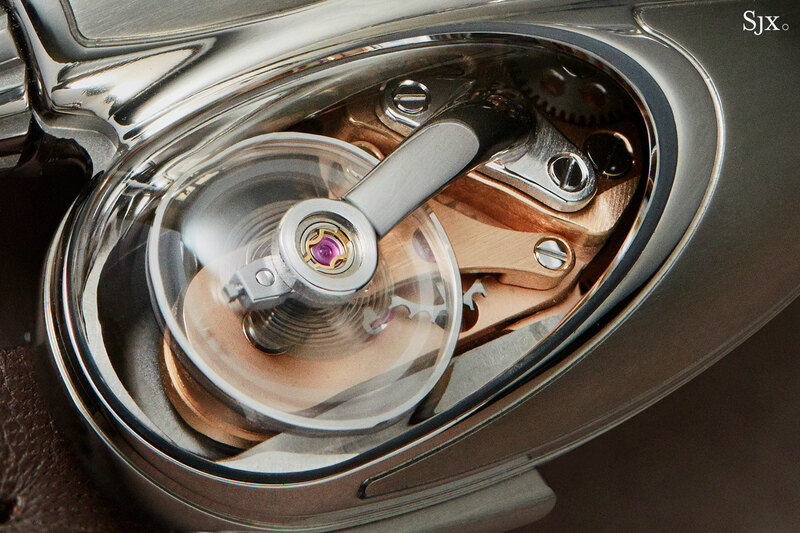 As in the LM2, the two balance wheels – free-sprung, adjustable mass balances – are linked by a planetary differential, which averages the rate of both balance wheels, each of which sits under a sapphire porthole. But the HM9 also borrows some of the fine finishing from the LM2. Visible through the sapphire windows are the rounded, polished steel bridges for the balance wheels. The base of each bridge is circular grained on top, while being bevelled and polished on its edges. 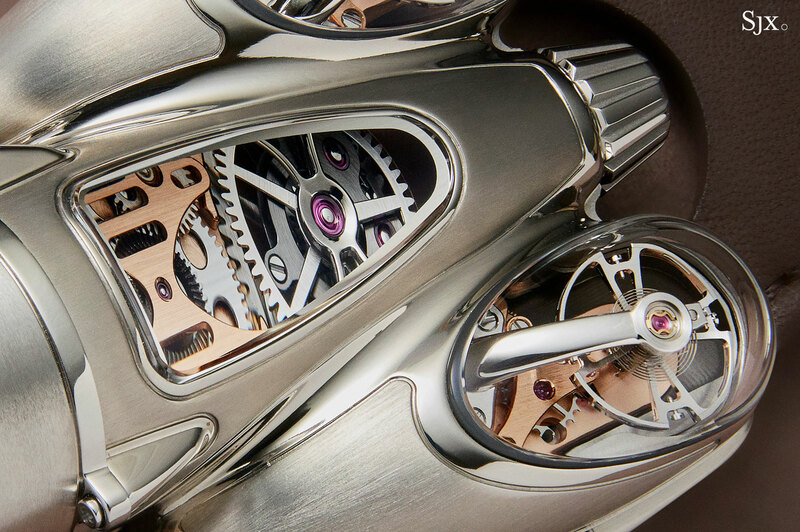 Glimpses of the rest of the movement are visible through the windows on the top and bottom of the case, but the thick, curved sapphire crystals slightly distort the view. Despite being mostly hidden, the rest of the movement is equally decorated, including polished countersinks for the largest jewels, a black polished, shuriken-shaped barrel bridge, as well as Geneva stripes on the main bridge. 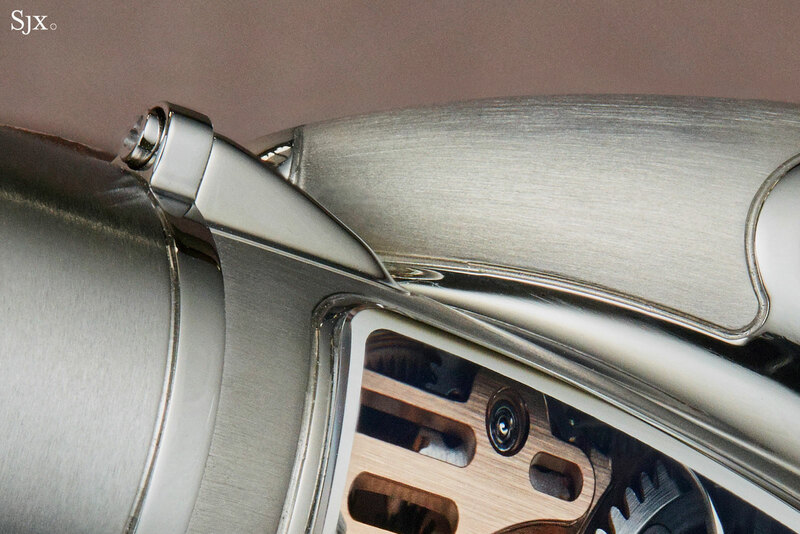 The movement is powered by a single barrel that gives the movement a 45-hour power reserve. In its entirety the calibre has a 301-piece part count, including 44 jewels. 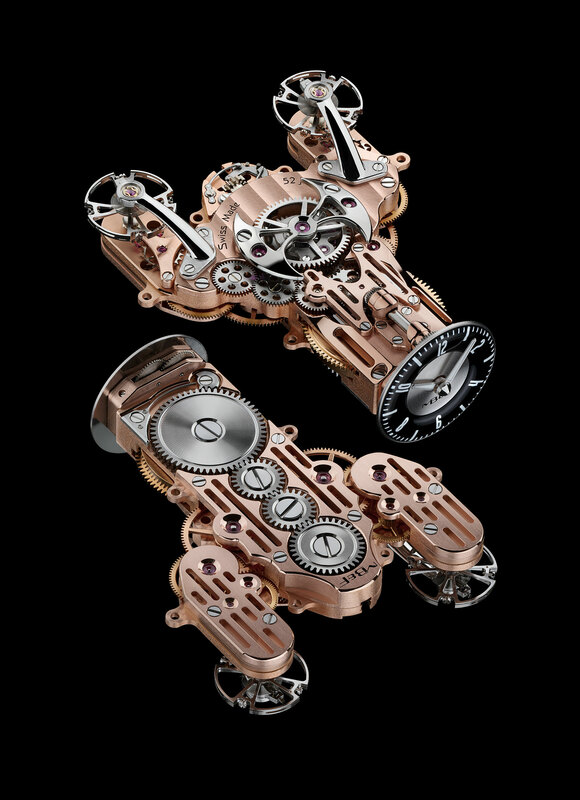 By comparison, the conventionally constructed LM2 movement is made up of just 241 parts, with also 44 jewels. A good deal of the added complexity is a consequence of the vertical time display. Bevel gears, essentially a pair of wheels with angled teeth that mesh perpendicular to each other, are required to translate the horizontal motion of the movement gears into the time display that’s indicated on a small dial on the front of the watch. 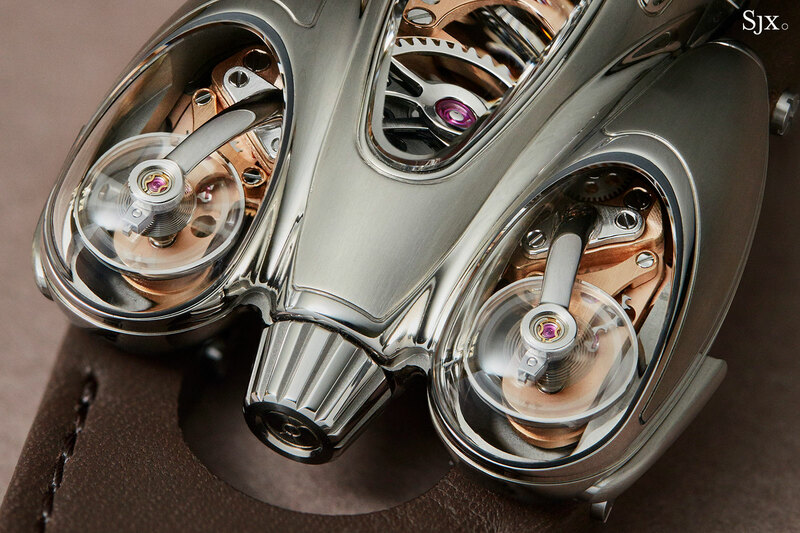 The movement sits inside an impressively formed titanium case that’s large – measuring 47mm wide and 57mm long (and 23mm high at its peak) – but lightweight and also surprisingly wearable, thanks to short lugs that sit on the underside of the case. Sleekly formed and almost aerodynamic in shape, the case is made up of 44 components, but is visually comprised of three distinct segments. 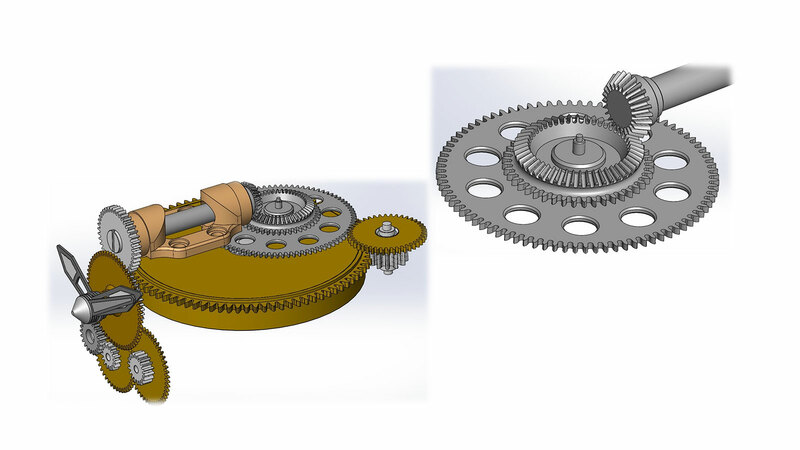 Two pods on each flank contain each of the balance wheels, while the central section indicates the time on the front end, with the winding crown on the opposite end. 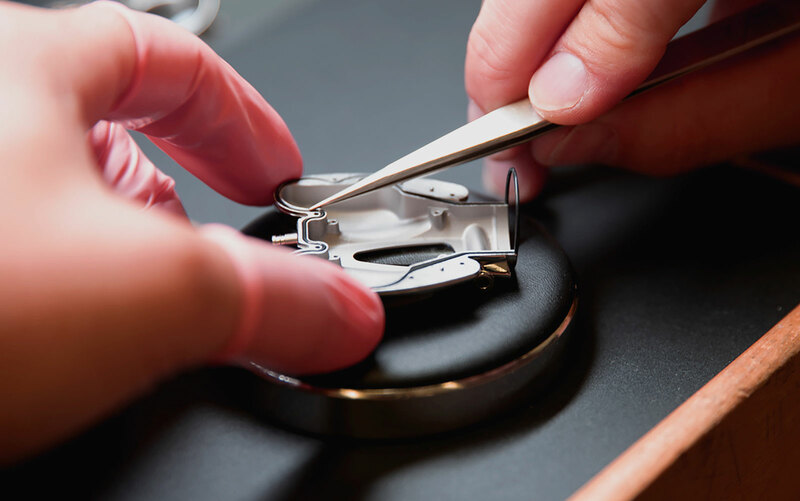 The contrasting polished and brushed surfaces of the case are impressively executed, especially given the form of the case, and no doubt required exceptional dexterity on the part of the specialist responsible for its finishing (named as Aurélien Bouchet of AB Product). While the upper surfaces of the case are linearly brushed, the underside is mirror polished. 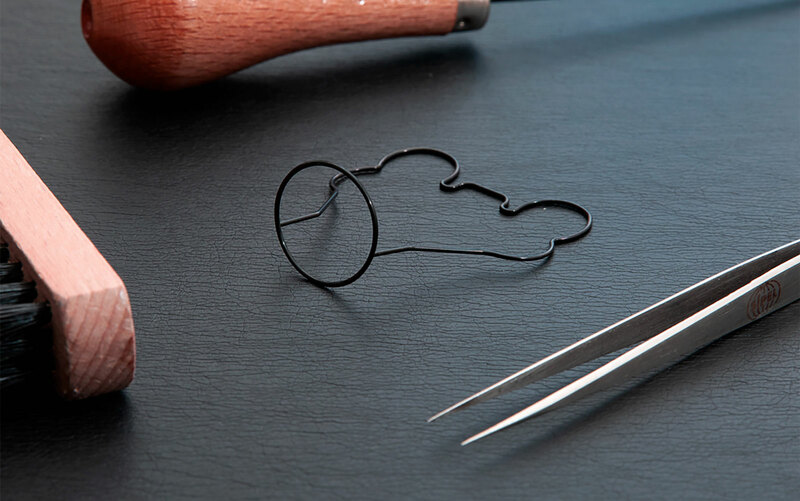 Despite the fantastical form of the case, it is water-resistant to 30m, sealed by a “patented three-dimensional gasket”, a one-piece O-ring on two planes. While two versions of the watch are available, both share exactly the same titanium case. 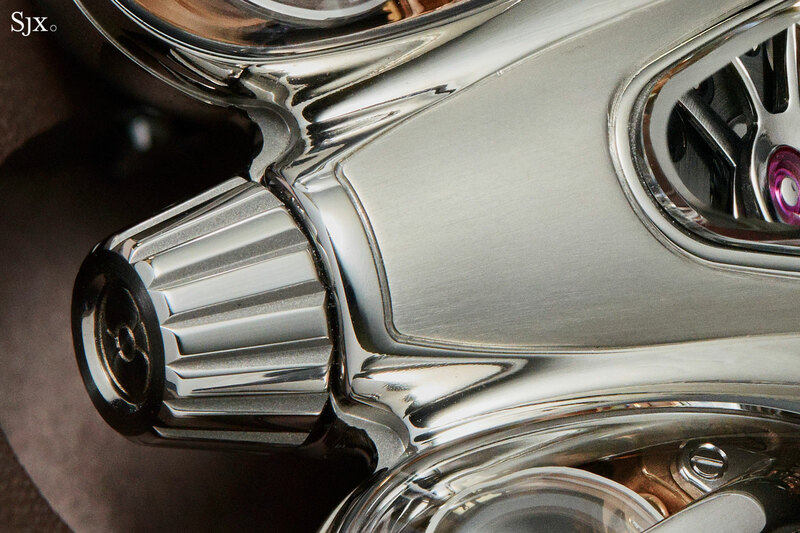 Where they differ are the dials – aviator- or speedometer-style – and the movement finish, either dark grey or rose gold. 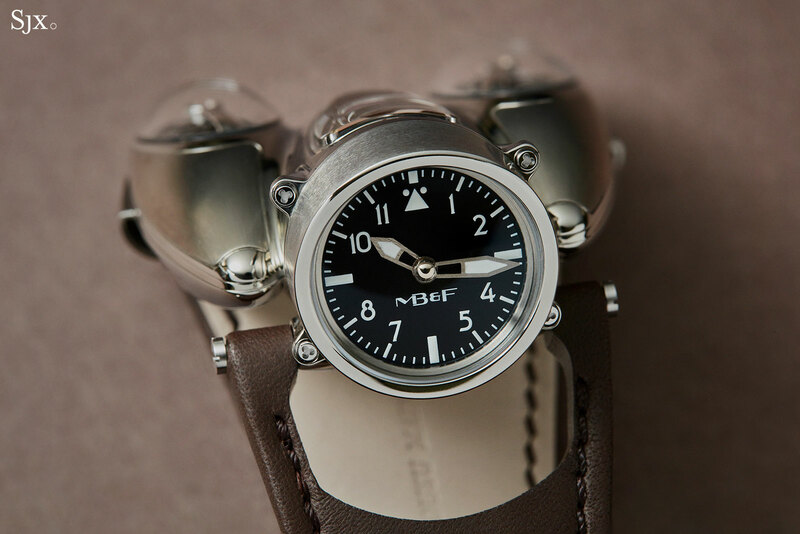 Nicknamed “Air”, the first version has a dial modelled on Second World War German airforce navigators’ watches, known as beobachtungsuhr, or B-uhr, with a distinctive triangle as the 12 o’clock marker. 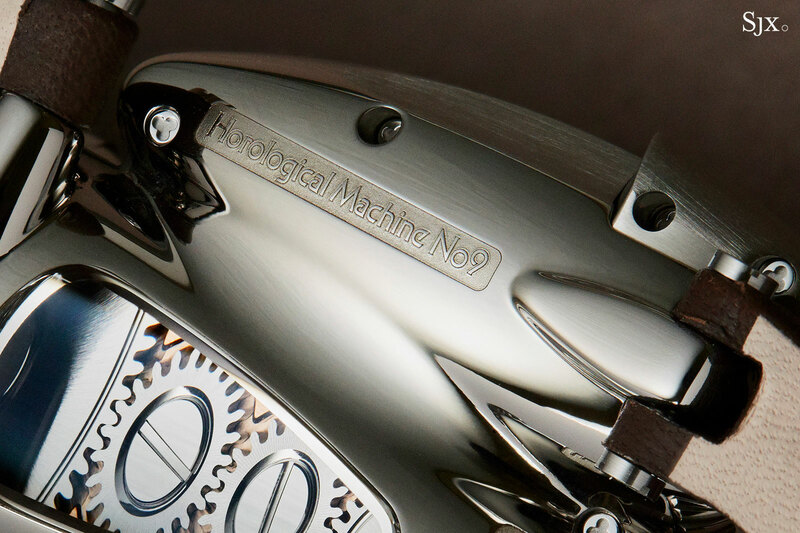 The HM4 featured a similar dial, and here it’s an obvious pair with the grey movement finish. 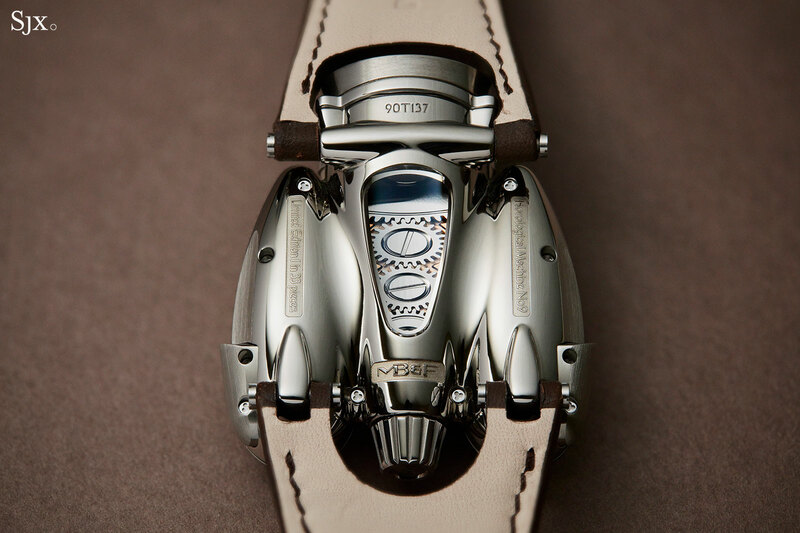 The “Road” edition, on the other hand, channels the retro-automobile feel found on other MB&F watches. The dial takes its cues from a vintage speedometer, while the movement has a rose gold-plated finish. 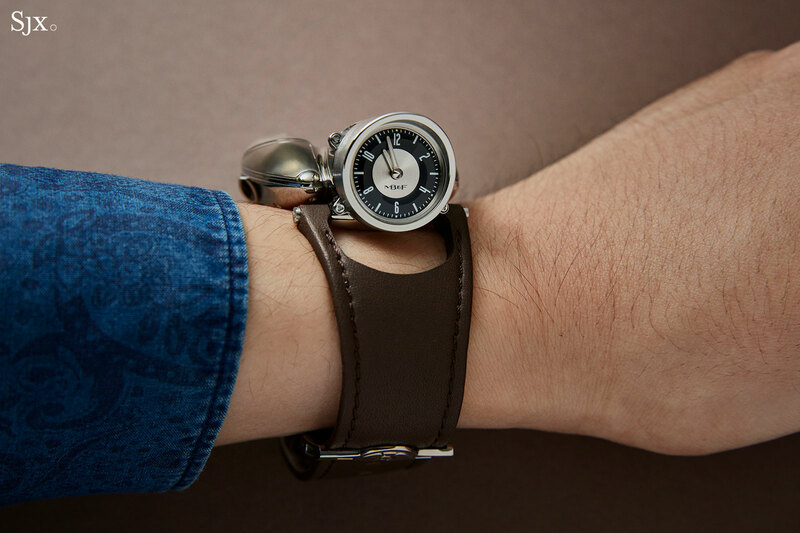 It’s an attractive combination, with also greater contrast between case and movement. The HM9 Flow is limited to 33 pieces in each style, priced at SFr168,000 or US$182,000, before taxes. In Singapore it retails for S$258,100.